www.sportseventsmagazine.com August 2017 29 Special Feature: 2017 NATURAL VENUES GUIDE dream, with Spanish moss-covered live oak street-lined canopies to lakes, trails, streams and rivers. Home to Florida State University, the city offers award-winning park systems and a variety of athletic facilities for everything from BMX and disc golf to swimming and polo. Cross country events are hosted in Tallahassee on a reg- ular basis and Lau- ren Pace, marketing communications director with Visit Tallahassee, said the city's award-win- ning Apalachee Regional Park will host eight major cross country events, including four national champion- ship events in the next five years. The park is located on more than 100 acres of a former unused portion of the county landfill, nine miles from downtown. The original course opened in 2009 and has been updated several times to accommodate major sporting events and spectators. With rolling hills, lowlands and forests, runners have mul- tiple loop options from 1K to 10K on the 10-meters wide course. Two trails also allow coaches and spectators a view through a wooded portion of the trail. 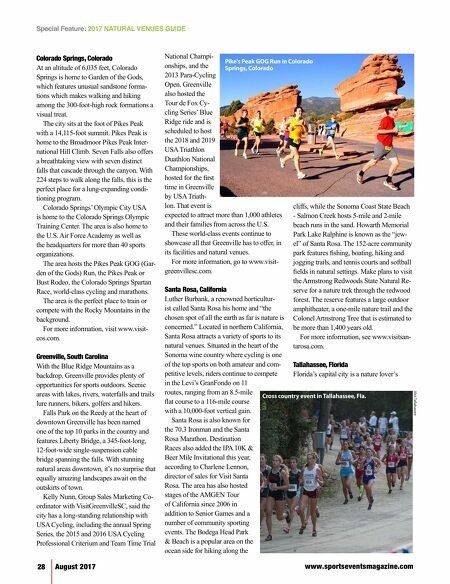 Upcoming events include the Florida High School Athletic Association Cross Country State Championships, the USA Track & Field Cross Country Nation- al Championships, the NCAA Men & Women's Cross Country Regionals and the NCAA Cross Country National Champion- ships in 2021. "We continue seeing tremendous growth in the economic impact and visibility that cross country events bring to the county," said Visit Tallahassee Director of Sports Brian Hickey. 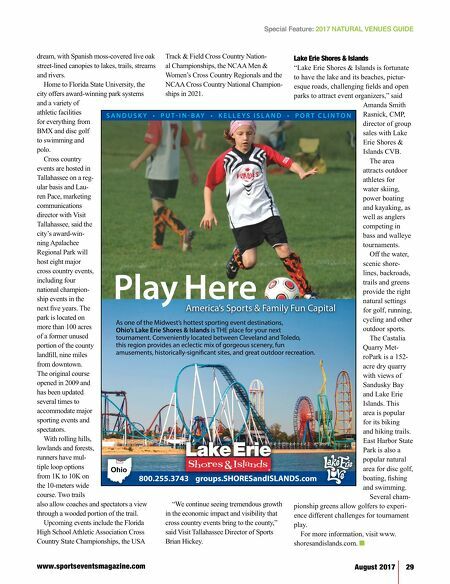 Lake Erie Shores & Islands "Lake Erie Shores & Islands is fortunate to have the lake and its beaches, pictur- esque roads, challenging fields and open parks to attract event organizers," said Amanda Smith Rasnick, CMP, director of group sales with Lake Erie Shores & Islands CVB. The area attracts outdoor athletes for water skiing, power boating and kayaking, as well as anglers competing in bass and walleye tournaments. Off the water, scenic shore- lines, backroads, trails and greens provide the right natural settings for golf, running, cycling and other outdoor sports. The Castalia Quarry Met- roPark is a 152- acre dry quarry with views of Sandusky Bay and Lake Erie Islands. This area is popular for its biking and hiking trails. East Harbor State Park is also a popular natural area for disc golf, boating, fishing and swimming. Several cham- pionship greens allow golfers to experi- ence different challenges for tournament play. For more information, visit www. shoresandislands.com. n 800.255.3743 groups.SHORESandISLANDS.com S A N D U S K Y • P U T - I N - B A Y • K E L L E Y S I S L A N D • P O R T C L I N T O N Play Here America's Sports & Family Fun Capital As one of the Midwest's hottest sporting event destinations, Ohio's Lake Erie Shores & Islands is THE place for your next tournament. Conveniently located between Cleveland and Toledo, this region provides an eclectic mix of gorgeous scenery, fun amusements, historically-significant sites, and great outdoor recreation.